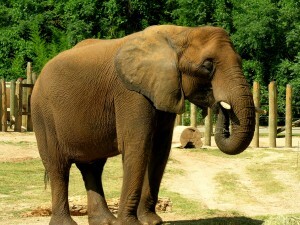 African Elephants are the largest land-dwelling mammals. Adult males can weigh up to 15,000 pounds and females up to 8000 pounds. Their thick skin and large ears help to keep them cool. The elephant’s trunk has more than 40,000 muscles and actually serves as another limb. Thick tree-trunk-like legs support their great weight. Elephants will eat up to 500 lbs of vegetation a day and drink up to 40 gallons of water at a time. Range: Southern Africa, Kenya, Zimbabwe, Tanzania, Zambia, Uganda, Democratic Republic of the Congo and National Parks in South Africa in grassland savanna and open woodland. The elephant’s vocalizations can be heard up to 5 miles away.